So you have made lots of Gelli Prints and background papers and you are not sure what to do with all the lovely and not so lovely backgrounds. Fear not we will turn those monoprints into beautiful and useful art! In the past we have made mini books, file folders, pencil case, collage caddies and more. It is always a fun and inspiring project. 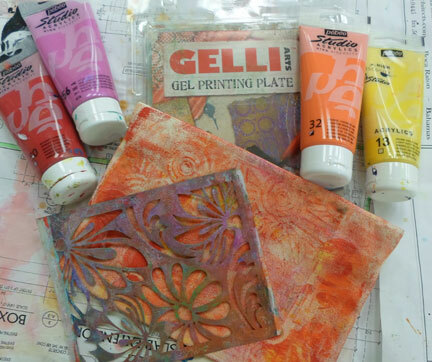 Gelli Plate Printing 101 is a pre-requisite to this class. Supplies to bring to class are your Gelli Plate, Non Stick Craft Sheet, Heat Tool, Brayer, Paper Towels and Baby Wipes.